Before you even think about scheduling a home tour, you’re going to need to get in the weeds about your financials. Often, real estate agents won’t work with buyers until they have a pre-approval letter in hand from a lender, because doing so will inform how much house they can afford. That said, even after tackling this step, you need to do some careful budgeting. “Do you want to be living for your house payment? What else do you do in your life?” are questions that the Phoenix-based Cushing frequently asks buyers to guide this process. Create a hypothetical monthly budget using the estimated costs of your mortgage, taxes, homeowners’ insurance, and, if you aren’t making a 20% down payment, private mortgage insurance -- then add costs for everything from your utilities and student loans to travel and entertainment. If you find that money is tight in this scenario, then you may want to lower your targeted max home price -- assuming you’re not interested in sacrificing your weekly date nights or annual beach trip. As cute as it sounds, your first home usually isn't your forever one. That means you should be keeping in mind factors that could affect the resale value that you can’t change. For example, you could find a totally renovated home that’s priced under your budget in the location you want… but it’s on a busy street. Even if it’s something you can live with, it may not be for future buyers, and if you need to get out of the home quickly later, that could be an issue. Also, you should plan to live in your newly purchased property for at least five years, according to Cushing -- move sooner and you’ll likely end up losing money on your initial investment. 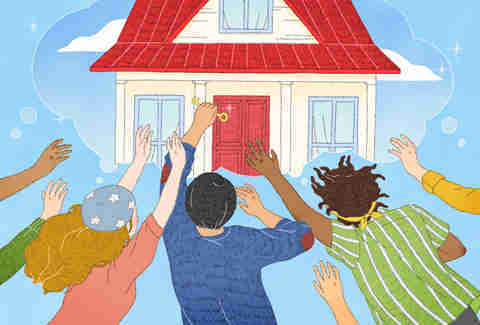 So, if you know your job could relocate you, or if you are still pining after spending a summer in France, now probably isn’t the right time to get serious about a home purchase. Not too long ago, buying a home without a real estate agent would have been unheard of. But, now that real estate apps and websites make it incredibly easy for potential buyers to search home listings, it may give some people hope that they can save some money by going it alone. But that’s ill-advised, according to first-time home buyers we spoke with. “It really makes things run so much smoother,” says Dara Loker, a first-time home buyer in Columbus, Ohio. “[Our Realtor] provided us with more information about each house and made the process of making an offer so much easier to understand and work through.” Another reason to enlist a human expert: Many online listing sites are slow to update, so a home that appears to be available may actually have a pending offer. The flip side of that is also true -- that these services don’t always show everything that’s available in a local market. Lastly, their home value estimates can be inaccurate, but a real estate agent can give you a clear idea of comparable, recent sales (“comps,” as they say in the biz) before you submit an offer. We get it, buying a home can feel scary. But finding the right mortgage shouldn’t be. FirstBank helps individuals achieve their goal of home ownership with straightforward mortgage options that work for everyone. Their mortgage specialists will walk you through everything you need to know -- like decoding the difference between all of the choices, from a 30-Year Fixed FHA to an ARM. FirstBank. Member FDIC. Equal Housing Lender. NMLS 458768. If you walk into a house and know you want to redo the kitchen’s entire layout and completely remodel two bathrooms, that’s usually too much for the average first-time buyer to take on, Cushing says. But, that doesn’t necessarily mean you should move on a fully renovated home, either. Instead, he suggests finding a house that lands squarely in the middle -- one that is in the location and price point a buyer wants, but may need a few cosmetic upgrades (paint, updated flooring, or changing out a kitchen countertop, for example). All of that will build equity in the home without you, as the owner, having to take a huge financial hit. If you utter the phrase “Well, we could just tear down this wall…” know that those renovations often get unexpectedly pricey, take substantial amounts of time to complete, and require liquid cash, fast. Like Loker (editor's note: and the author of this piece) you may find that the first (or second, or even third!) 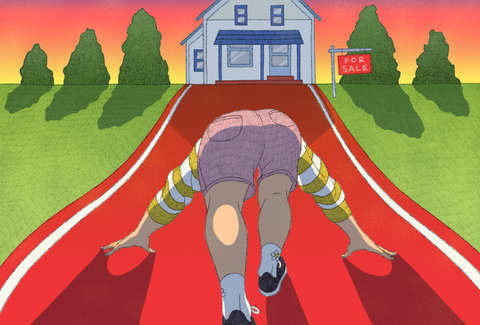 time you bid on a home, you’re not successful. Full disclosure: It is a roller coaster of emotions, which may or may not conclude with you and your partner being forever triggered by House Hunters reruns. But, there are some positives to being outbid, Cushing explains. For one, you learn about the offer process, which can give you a leg up when the next home comes along. Additionally, being patient means you have additional time to prepare -- to save more for a down payment, pay off debt, and be assured you end up in a home you love while being more financially secure. Take note: Being frugal doesn’t stop once your offer has been accepted. Big purchases, even one-time purchases can affect your ability to close on a house -- a lesson first-time buyer George Garay learned when looking for a home in Philadelphia with then-girlfriend Allie McGill. “What Allie didn’t know was that I had just purchased her engagement ring two days before we found our house,” Garay says. “While going through the financial screening process… I needed to write a letter explaining the reason for my recent large purchase, all while trying to keep it a secret from Allie! I was so stressed that she was going to find out that I had bought her ring and the surprise would be ruined.” (It wasn’t, and she said yes, FYI!) Besides engagement rings, don’t buy furniture, take on any additional debt, or change jobs (if you can help it) during the home-buying process. If you do, be transparent about the change with your agent and lender. If there’s a valid excuse (like an upcoming engagement) and you can prove you can still afford the home, it should work out -- but there’s no need to risk it. Before closing on a house, you’ll need to get a home inspection -- a step Cushing and Macklin both warn should never be skipped, even if you think the house is perfect and you want to make a competitive offer. On average, a general home inspection will cost between $300-$500. The home inspector may advise you to get more specialized inspections as well -- such as air quality or an in-depth look at the fireplace -- if they find something off with the house. Besides inspections, be prepared to cover the property taxes for the first few months, which are put into escrow (which is just a fancy word for an account held by a mutual third party) during closing, too. Lastly, pay attention to local housing laws. For example, in Philadelphia, the Garays learned there is a “transfer tax” that requires the buyer and seller to each pay a 2.1% fee of the closing price to the city. That amount seems small, but on a $300,000 house, that’s more than $6,000 -- which isn’t exactly chump change. But, don’t stress! Armed with some research and solid financials, you’ll be prepared for whatever the home-buying process throws at you.